This is a big favourite to cook at the moment - I want to say very springy, but by that I'm referring to the season, not the texture! It's loosely based on the Venetian dish that falls halfway between a risotto and a soup. My version is simply to fry onion and bacon in olive oil, then add arborio rice and a bay leaf and get the rice well covered with the oil. Add stock (or just water) and bubble away until the rice is cooked - you can have it as moist as you like. Then throw in frozen (or fresh) peas and, because I'm addicted to them, some broad beans and cook for a couple more minutes. Season and add parmesan and head to the balcony to enjoy! A variation is to cook whichever legume you've chosen (sugar snap pea, broad bean etc) separately and then puree half, with some cooking liquid, and stir that in with the rice. A bit of mint goes nicely as well. risi e bisi! yuuum! why do i not have a kitchen at the moment? whu not even a wooden spoon. my only problem making is too many herbs. is it a mint dish because of the peas? 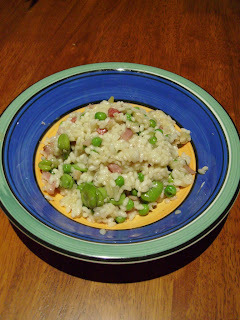 is it a parsley dish because of the ham and the garlic and the risotto-ishness? or is it after all a risotto which needs bay and garlic? i LOVE this dish. we must go out to lunch one of these days! The bane of my early cooking existence was an overt tendency to throw in something of everything, so that all of it tasted like not very much. With my own balcony herb garden at my beckoning I have become more restrained, though rosemary does still find it's way into unlikely places since I can't resist it. Consider a lunch date a given next time we're in correlating cities!